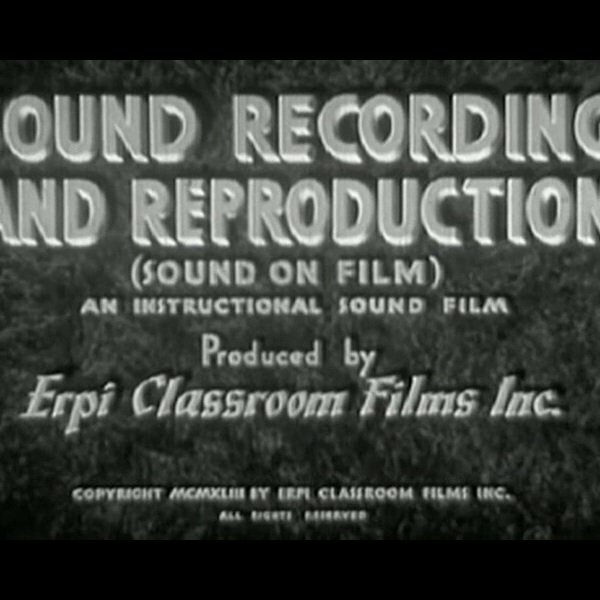 "For use as part of a talking picture, the sound to accompany the photographed action must be recorded for reproduction when the picture is shown." 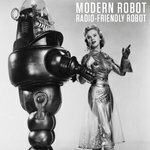 Like our first album "The Age of Machines", "Sound Reproduction" is in three parts. 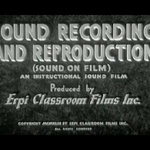 It begins in 1943 with a film about sound tracks. At this point, it wasn't one word — soundtrack — but two words, which is really what this movie is about. 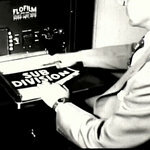 A strip on the side of the film itself is burned in dark and light stripes, and that track is read by a photoelectric cell and converted into sound, like magnetic tape (a topic that we get to later!). The way this show starts is one of my favorites. At one minute in, Kyle sets up a fantastic groove and at the same time, you can start hearing high, shimmering sounds floating in — this is Nicholas Stott. This was our first show with Nicholas, and since it's far from obvious, it's a guitar he's making those awesome sounds with. The first track ends with a sequence of V-i's (a little music theory, anyone? ), then we flip the beat around just before the second track, "To Review". By the middle of track 4, "The Reproducing System", we've worked in to a heavy groove and in another one of my favorite moments of this show, the orchestra comes crashing in! (It sounds like some Beethoven, but if someone knows, please tell me). By the end of the track, Kyle's hi-hat lines right up with the strings, but keep in mind we didn't know what was playing on the movie's soundtracks — this is total serendipity. The orchestra joins us again at the beginning of track 6, "As Recorded in New, Orthophonic, High-Fidelity Sound". The second movie actually started at track 5, "The Sound and the Story", which is the name of this 1956 film about how LP's and 45's were made, all the way from the recording studio through the different steps of pressing vinyl and shipping them out. 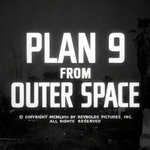 I actually learned quite a bit from this film, so you should watch the original on archive.org if you're curious how a record is made. This second section has some of the best bits of inserted dialog: "Today the engineers record the orchestra as a complete unit... all it takes is recording equipment of enormous cost and capacity." How do I record these shows? On a $200 recorder that I can hold in my hand. 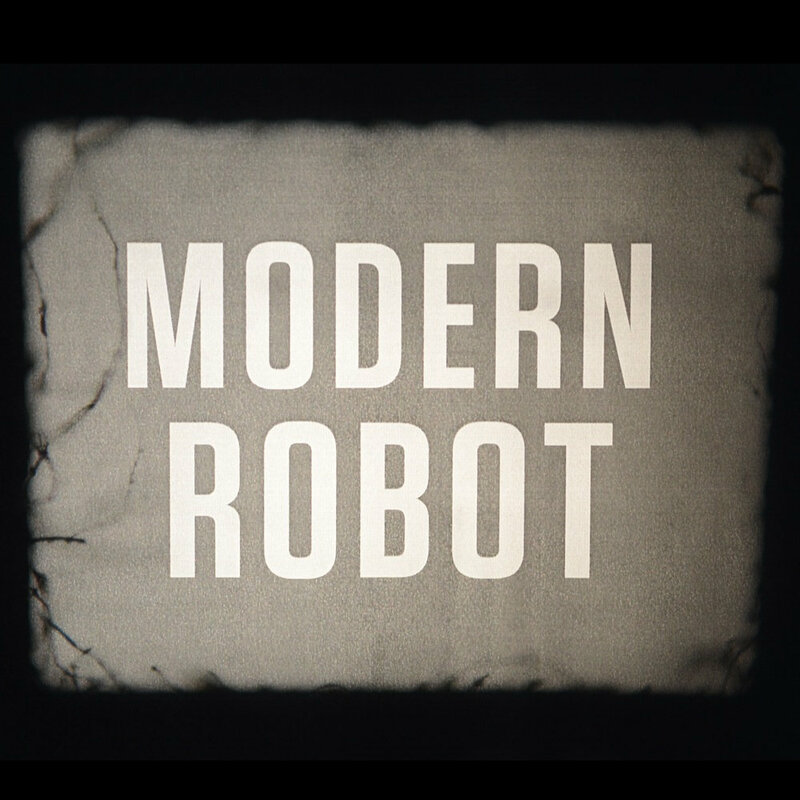 Most Modern Robot shows have a ballad or two. In this show, it comes as track 11, "Now It's Prepared", which is accompanied by more of Nicholas's atmospheric sounds. The atmosphere extends into track 12, which slowly works into the extended themes of track 13, "The World's Greatest Artists Are At Your Service". I clocked this one, and we're playing a 4/4 with quarters at about 60MM — wonderfully slow but Kyle is filling it all in with 32nd notes. The orchestra comes in again to start track 13, "New Thrills and Pleasures to Millions", and also the third film of our show. From 1958, and it's a promotion for RCA's first version of a cassette tape, which is a chunky thing about the size of an iPad. But this was quite an advance; before this, tape meant a reel-to-reel machine. "So simple! So convenient! So practical! So easy to use, and with all the unquestioned advantages of tape now ready to move the tape recorder out of the closet and into the living room where it belongs — as part of the newest and most exciting home entertainment center for the entire family!"